Former star of the US version of The Office and now acclaimed Hollywood director, John Krasinski was spotted undertaking dutiful hubby duties at the premiere of his wife Emily Blunt’s new film. And hasn’t the lad done well? With his rich burgundy suit acting as an unflashy canvas on which to splash a printed shirt shirt and knitted tie. Stand back everyone, the king has arrived. 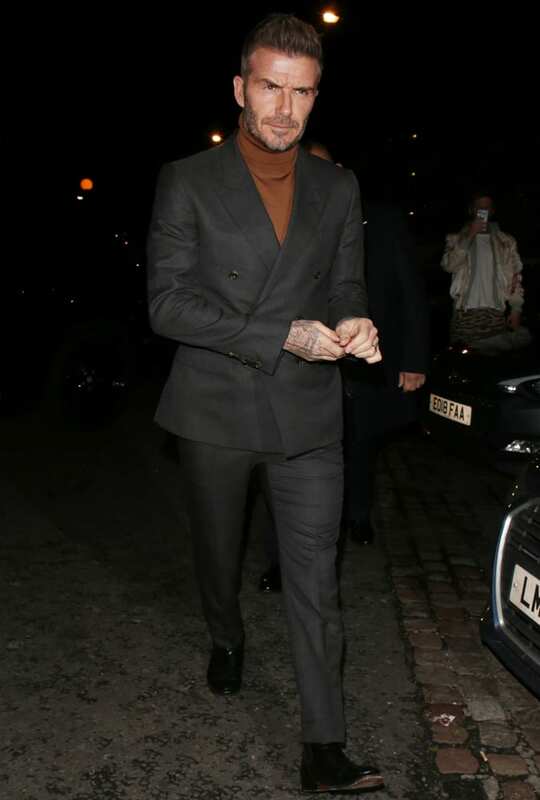 At a party for his Haig whisky brand, Becks looked every part the businessman, with a slick autumnal brown roll neck slotting in much better than a chunkier option would beneath tailoring. And what a fine piece of tailoring it is indeed, with not a break nor straining button in sight. Off the bat, actor Colman Domingo has a fantastico name. A real title for the ages. He’s also one of the snappiest dressers in the business. Just feast your eyes on these billowing mid-century style trousers, with a western style shirt tucked in and a long overcoat looking sleek on top. There are a lot of lines and shapes going on here, but it’s all kept under control by the neutral colour palette. Bravo. We have to admit, Dave Franco was unlucky not to make it onto our Best-Dressed Men Of 2018 list. To compensate for it, old boy, we’ve popped you down here. That contemporary crossing of simple tailoring with the burst of pattern and colour in your shirt is going down a treat in the FashionBeans office this week. We’d usually say it’s best to leave the capes to the superheroes, but seeing as Moonlight star Mahershala Ali showed his off at a screening of the latest Spider-Man flick, it gets a pass from us. The minimalist vibe works well paired with the high cropped trousers and understated patterned shirt for a dose of inimitable Scandi-chic. A leather jacket is a big investment, but if you take care of that beauty, it’ll last a lifetime (weight fluctuations depending). Singer Anthony Russo’s sound investment comes in an uncomplicated, collared cut. Free of any distracting details, it allowed Russo to opt for an eye-catching shirt at the iHeartRadio Jingle Ball, while slim trousers balance the jacket’s heft. There was no knockout in the ring during the recent heavyweight championship bout, but backstage, rapper Nas was dishing them out like Muhammed Ali (style-wise, of course). First, we got a jab of sky blue with the roll neck, before a swinging haymaker with the tonal suede jacket and a balancing pair of Chelsea boots and jeans for the victory. He was a new entry on our Best-Dressed Men In The World list this year, and R&B singer Khalid looks set to continue his rising sartorial form as we head into 2019. His look can best be summed up as tailored streetwear, with hotter-than-hot brands repped on technicolour menswear staples. It’s a cohesive mismatch ably backed up on this occasion by a pair of sneakers. Not a regular on this list, comedian Jack Whitehall has seemingly popped out of nowhere with one of the best looks of the week, courtesy of some masterful high-low styling. The sharply cut bomber jacket works well as a casual alternative to a blazer alongside a pair of more formal suit trousers and seasonally appropriate boots. Jaden Smith’s fashion sense, like his Twitter philosophising, can be a little, ahem, out there. However, the multi-talented 20-year-old was bang on the money with this toned-down streetwear look. The hoodie, coming from Smith’s own album merch, pairs up nicely with the joggers, which offer a graphic take on the side-stripe trouser, while below it’s clear the dad trainer is still alive and kicking.